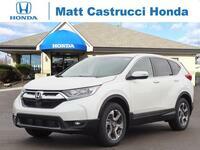 Over the last few years, the Honda CR-V has consistently been one of the most popular crossover SUVs on the market. Its combination of great style, modern features, and strong performance make it the epitome of what anyone wants in an SUV. While the CR-V is undoubtedly held in high regard, how well does it compare to others? One way we measure the prestige of a vehicle is by seeing how it stacks up with other models in its class. Here, we are putting the 2019 Honda CR-V up against the 2019 Toyota RAV4. To be as fair as possible, we are using the base models in our comparison. When it comes down to it, what’s under the hood is really what matters most. The base model (LX) of the 2019 CR-V comes with a 2.4-liter inline four-cylinder engine powered by 184 horses. Every trim above that (EX, EX-L, Touring) comes with a smaller, more efficient engine. These trims feature a 190-horsepower, 1.5-liter I4 engine. Both engine options produce up to 180 pound-foot of torque which contributes to a maximum towing capacity of 1,500 lbs. when properly equipped. 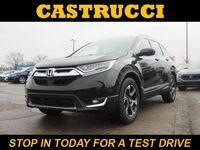 Other standard features on this great crossover include automatic climate control, Bluetooth connectivity, a multi-angle rearview camera, and USB audio. 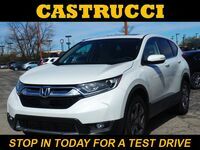 Come down to Matt Castrucci Honda to learn more about what comes available on the 2019 Honda CR-V. Our team will go over everything else you need to know and we can even get you set up with a test drive. We hope to see you soon!